Akridge & Akridge Chiropractic is collecting canned food and donations through the end of September to help the Bellevue Food Pantry restock its shelves. Those who donate by July 18 will see their contributions turned into artwork. 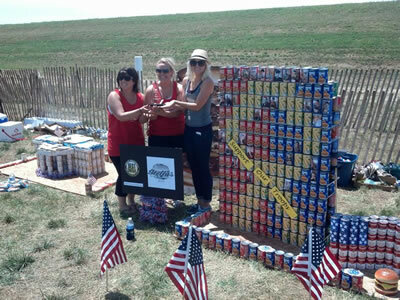 These will be used at Bellevue’s Riverfest celebration as part of the Can Opener Sculpting Contest, where competing teams will turn the cans into giant sculptures with a patriotic theme. Akridge & Akridge will continue to collect donations through September as part of the office’s ongoing community service projects. Bellevue Riverfest will be held from 5 p.m. to 1 a.m. July 18 and 7 a.m. to 1 a.m. July 19 at Haworth Park. Other events include a Balloon Glow Friday evening and the “Fireworks Extravaganza” Saturday night, Kidz Zone, RiverFest Run, and Car Show & Shine. The event also hosts the Nebraska State BBQ Competition. RiverFest is only $1 at the gate and the public is welcome to bring lawn chairs and blankets to enjoy the music and fireworks; however, coolers will not be allowed.